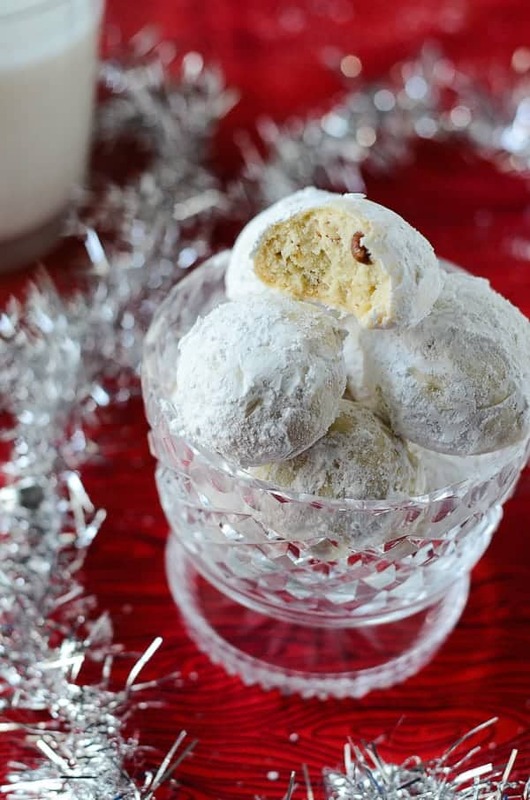 Straight out of Nana’s recipe book, Nana’s Russian Teacakes AKA “nut balls” are the same soft, buttery, melt-in-your-mouth teacakes found all over the world at Christmastime. We’re over the hump! Thanksgiving has (successfully) come and gone, and now we’re full-speed ahead plummeting toward all things red and green and glittery. I, for one, am alright with that. Although, I’m finding it hard to believe that Christmas is less than a month away already. Wasn’t I just waxing poetic about how much I was longing for cooler weather and pumpkin flavored everything? My pumpkin craving has been curbed, for sure, but I’m still on the lookout for the cool weather. WTF Florida. It is November…high 80’s are totally unnecessary in November. I really don’t know the proper name for these little white balls of love. 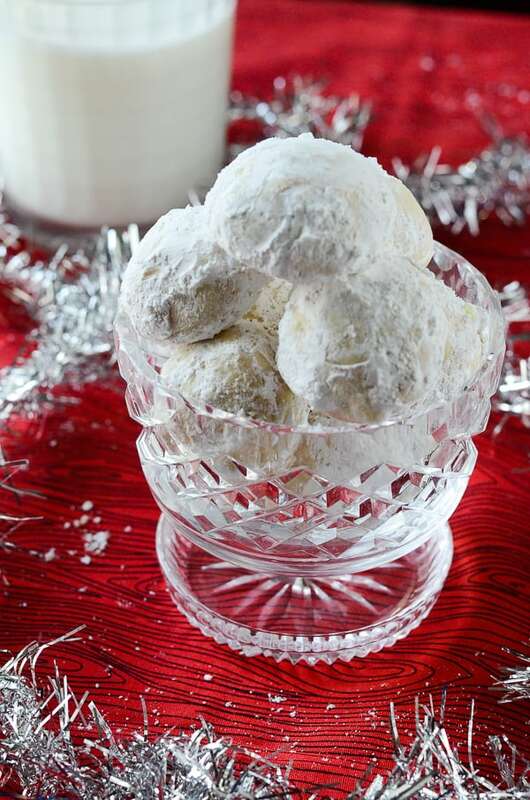 The yellowed page in Nana’s recipe book just calls them Nut Balls; I’ve also seen them named Russian Teacakes, Italian/Mexican Wedding Cookies, Snowball Cookies…whichever name you choose, the recipe is basically the same. They’re traditional Christmas cookies somewhere all over the world! Butter, flour, sugar, nuts: the four main components of these cookies are simple, but boy, do they command an audience! Out of all the Christmas cookie recipes that I make every year, my own creations and from Nana’s book, these are probably the most favored. My grandfather, my husband, my bestie’s father…they all tend to get a bit crazy about them. Even Nana herself loved them best. I had to bake these no less than three times last Christmas. The first batch was completely decimated by the hubs in a forty-eight hour period. I was less than thrilled but, lucky for him, they’re terribly quick and easy to throw together. I’m afraid to think how many of these we might plow through in 2015. One batch down at the time of this post, and it isn’t even December. Anyone want to place bets? Straight out of Nana’s recipe book, these “nut balls” are the same soft, buttery, melt-in-your-mouth teacakes found all over the world at Christmastime. Combine butter, powdered sugar, flour, salt, and vanilla in a large bowl and mix together with a wooden spoon. When mixture begins to come together, add nuts and continue mixing. Shape into 3/4-1-inch balls and place at least an inch apart on baking sheets (these cookies don’t spread much). Bake for 25-30 minutes, until light golden brown. 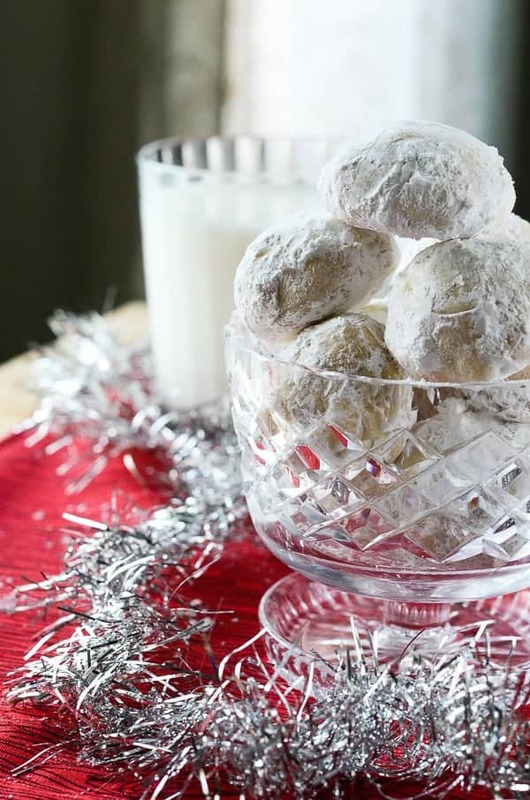 Allow cookies to cool to room temperature, then roll in powdered sugar. What is the one cookie you make for the holidays that everyone goes crazy for? 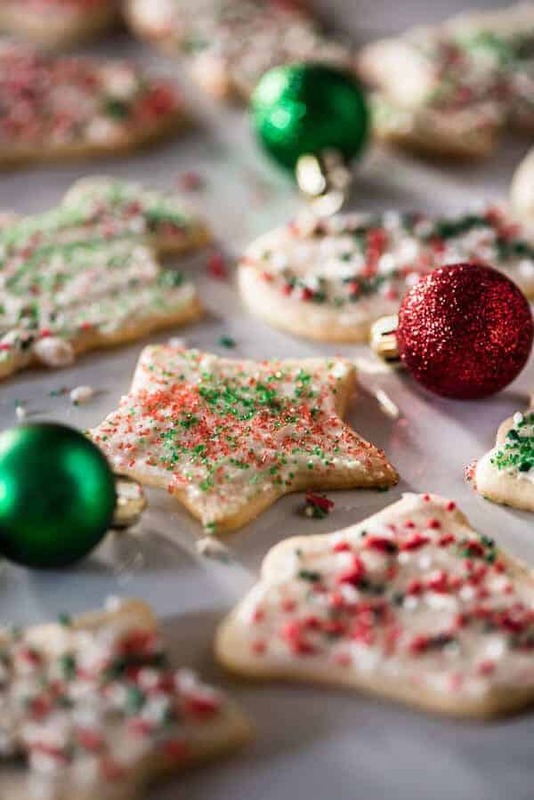 Looking for more Christmas cookie recipes? Have at it! If nuts aren’t your thang, check out this incredible list of #Cookielicious treats! 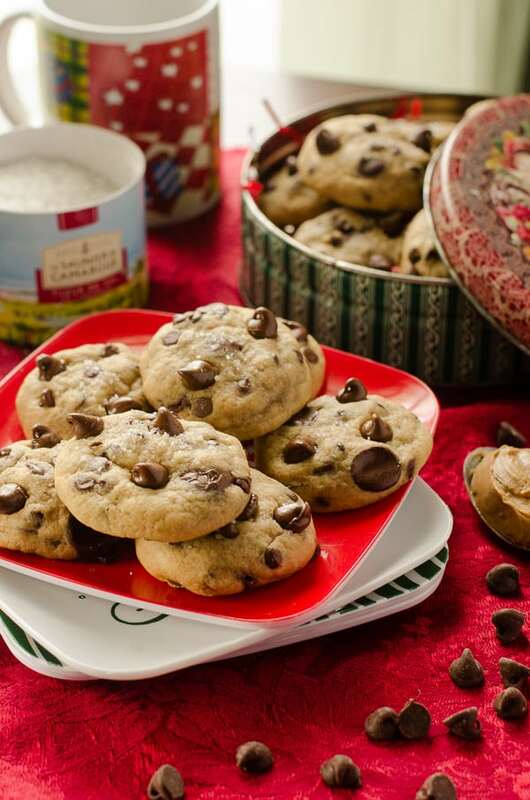 To get more great cookies recipes, check out our Cookie Jar Pinterest board. 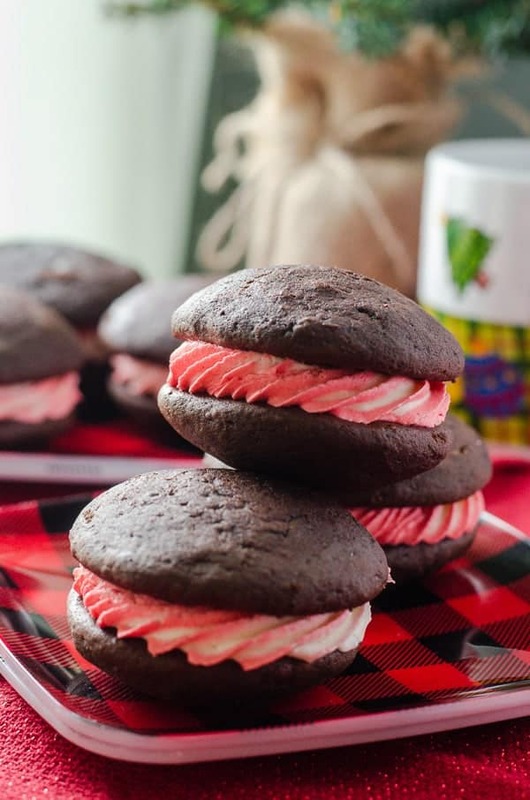 These are my ultimate “Holiday” cookie! I remember these from my childhood, when my best friends Mom would make them for all of us kids! Fabulous! I think you are right. Every culture has a recipe for these cookies. 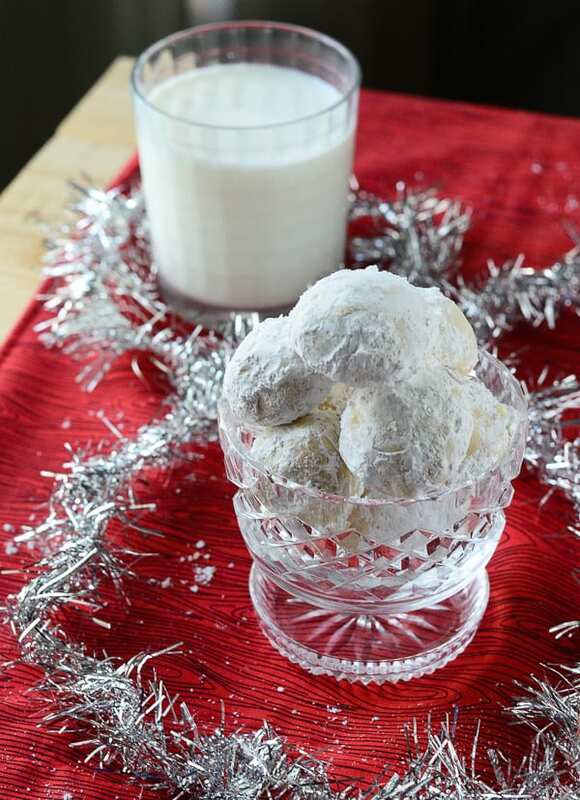 We call ours snowball cookies. Great choice for this event. So pretty! These are one of my favorite holiday cookies. Love the photo with the bit into “Nut Ball”. They do look quite addicting!